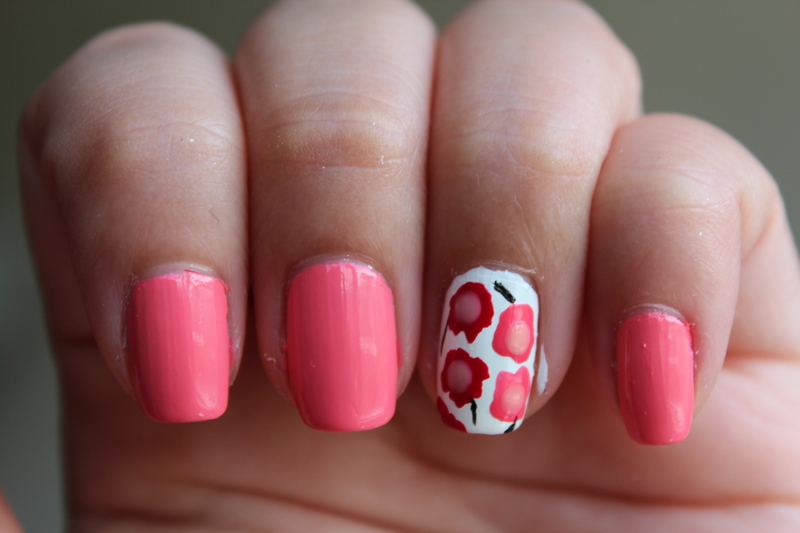 I know spring is technically over, but I’m still loving all the different flower designs that I’ve been coming across. So I figured, I’d keep the flower tutorials coming. 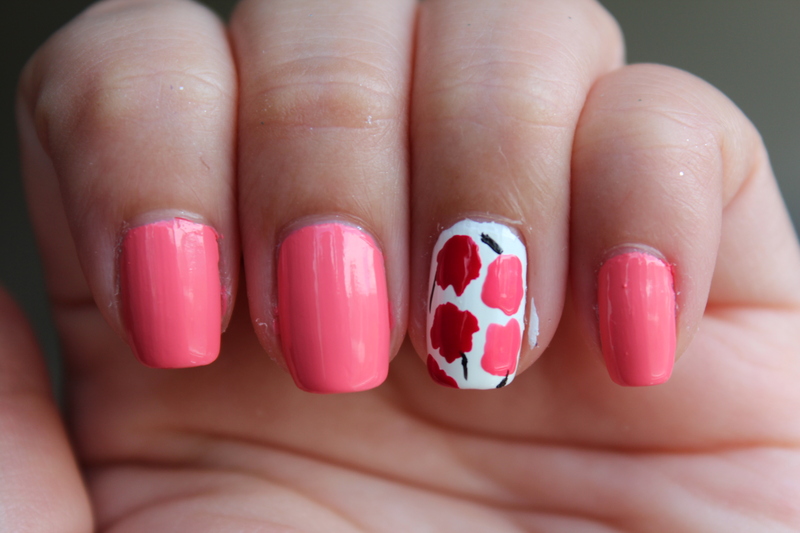 Step 1: Paint your ring finger with white nail polish and the rest of your nails the pink nail polish. 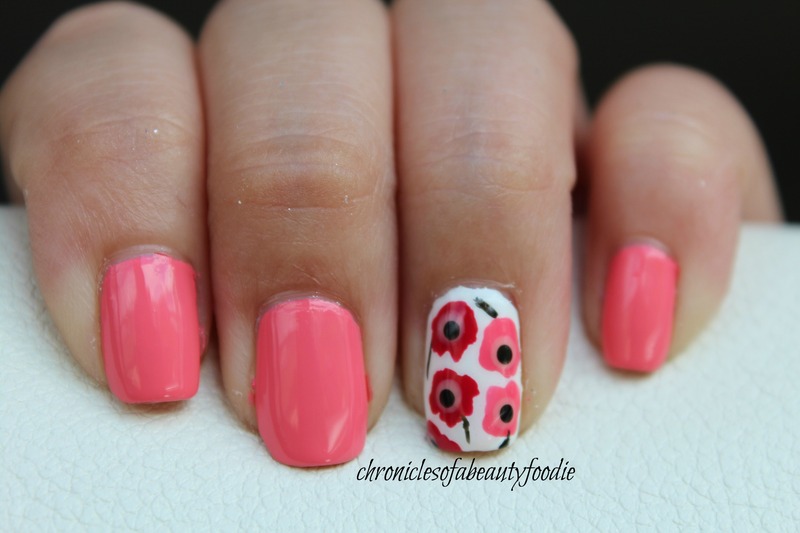 Step 2: Using the red and pink nail polishes, paint blobs on your ring finger (these will be the flowers). 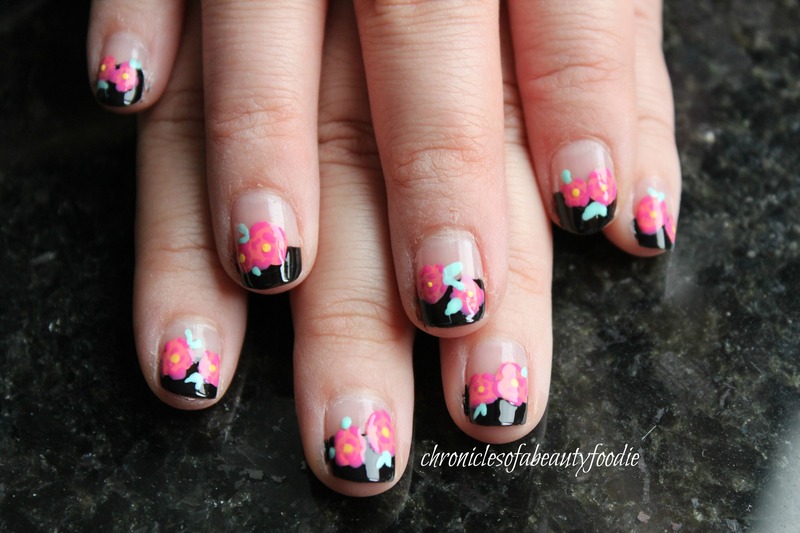 See my Spring Flowers French Manicure post for tutorial/example pictures. Step 3. Using your black striper, draw some lines from your flowers to be the stems. 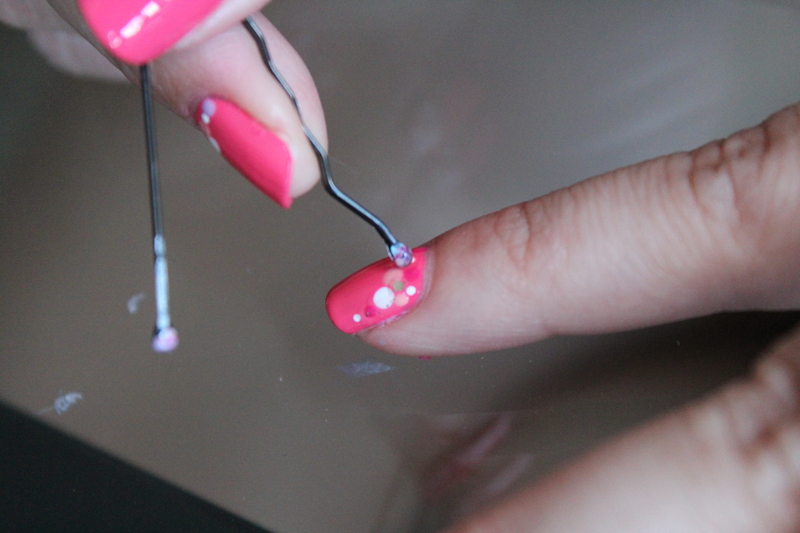 If you don’t have a striper, you can use a toothpick and your black nail polish. Step 5. 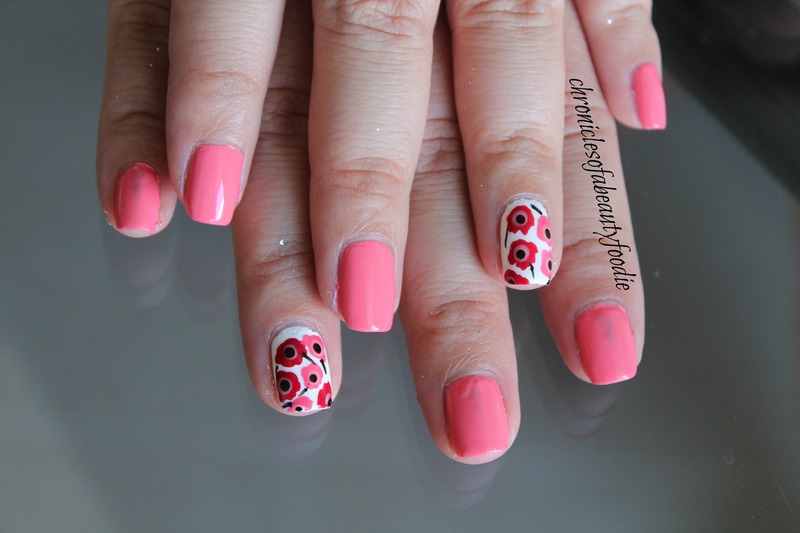 Using your smaller dotter and your black nail polish, place a dot inside your pink dot. 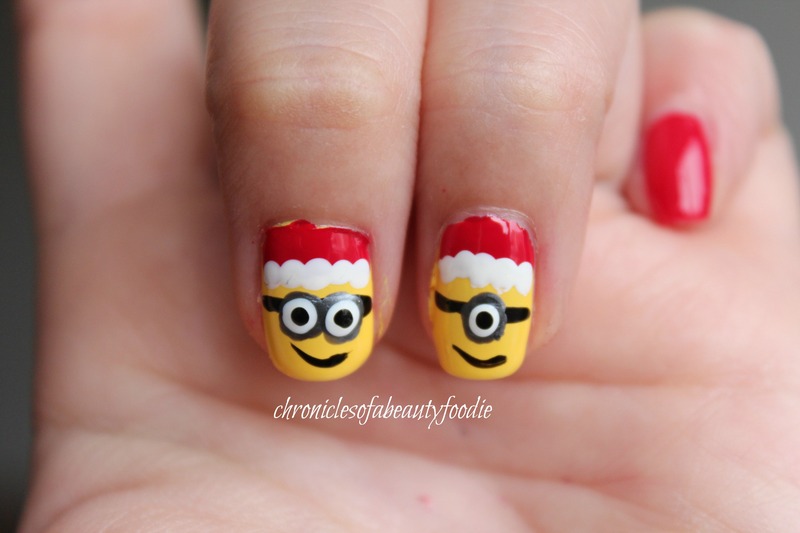 Add a top coat, and you’re done. 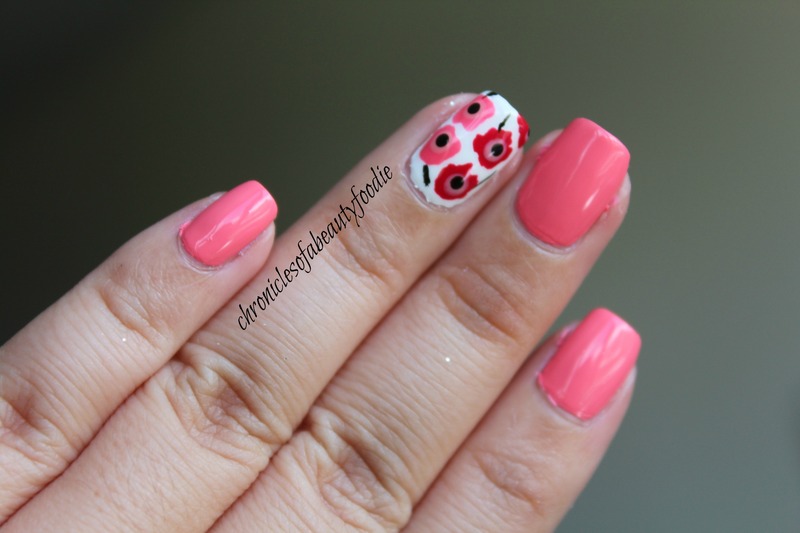 Pink and black has to be one of my favorite color combinations. I think there’s just something about the contrast that I love. 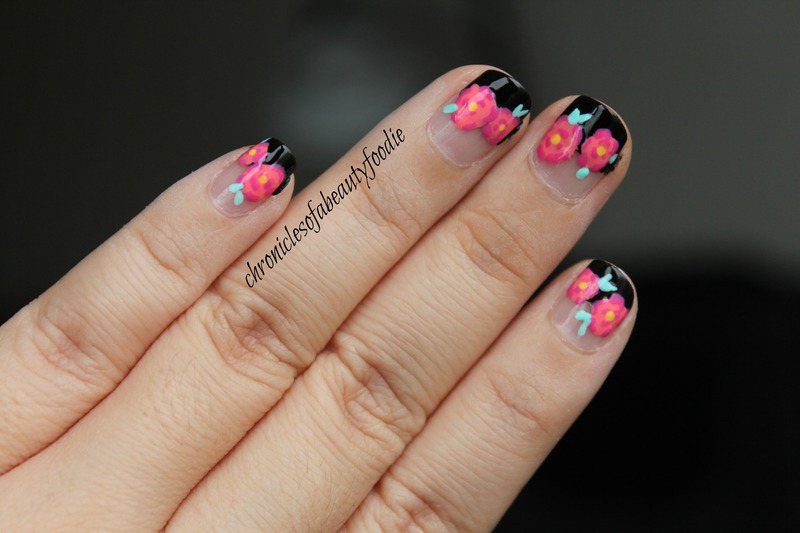 So I thought to myself, since pink is such a standard color for flowers, I had to use the pink and black color combination in my next spring flowers tutorial. So here you go. 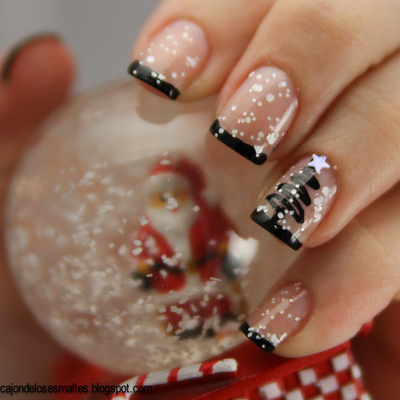 Step 1: Using the black nail polish, french tip your nail. 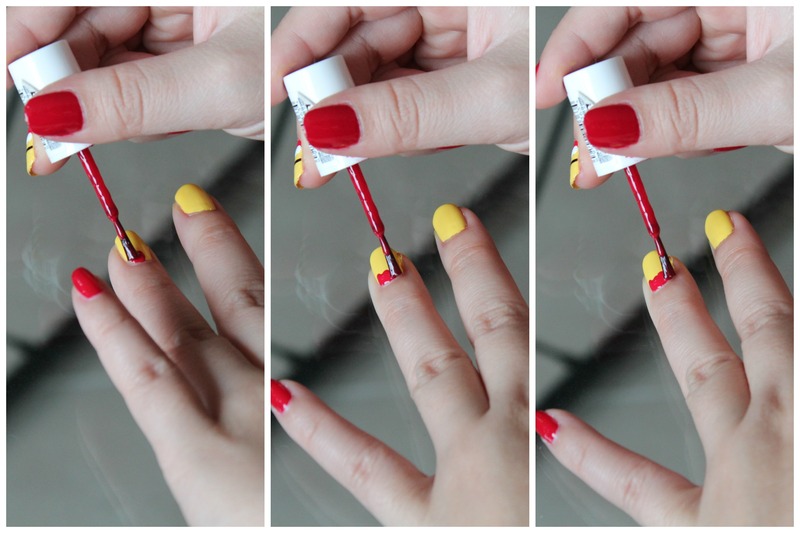 The easiest way is roll your finger as you paint across the nail. It doesn’t need to be exact since we’re going to paint the flowers on top, but if you want a clean line, you can also use a piece of tape. 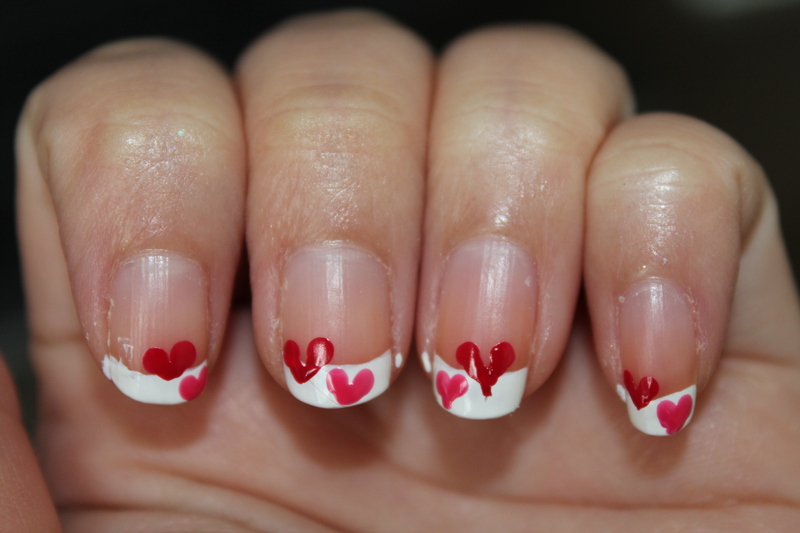 If you use tape, make sure it’s pressed on good (leaving no gaps between the tape and your nail). 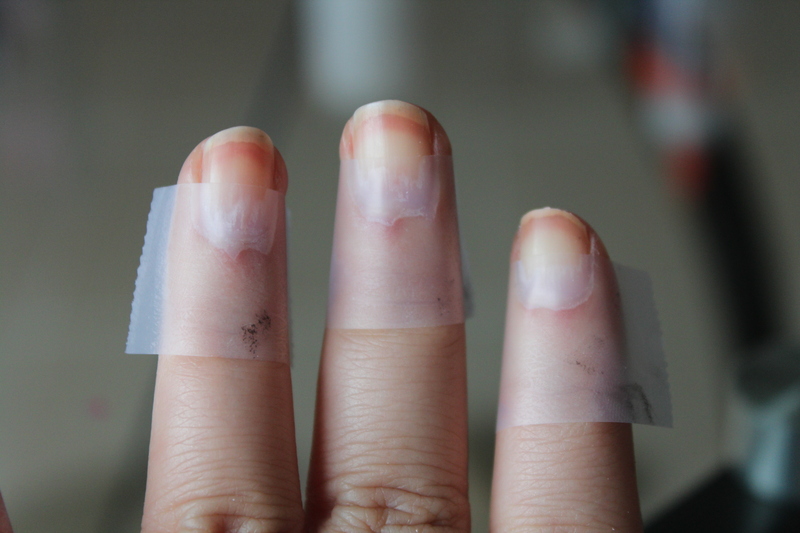 Paint on the black polish and remove the tape immediately (don’t wait for it to dry). 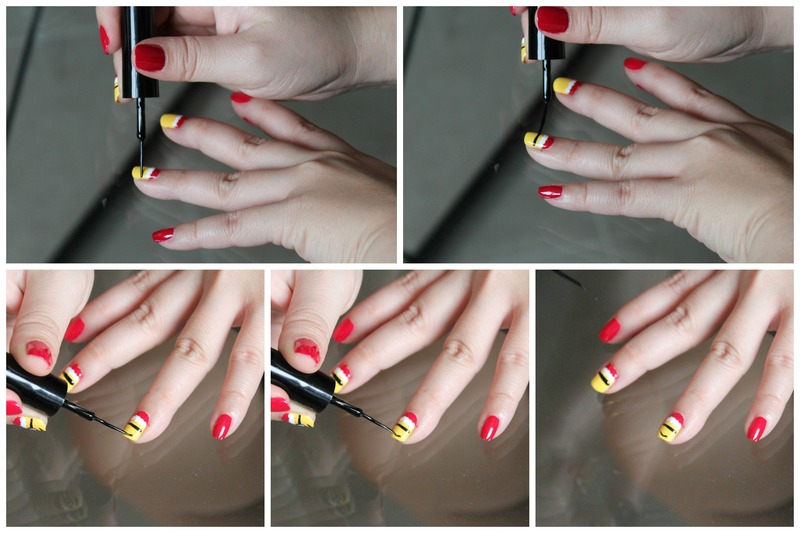 Step 2: Let your nails dry to the touch. 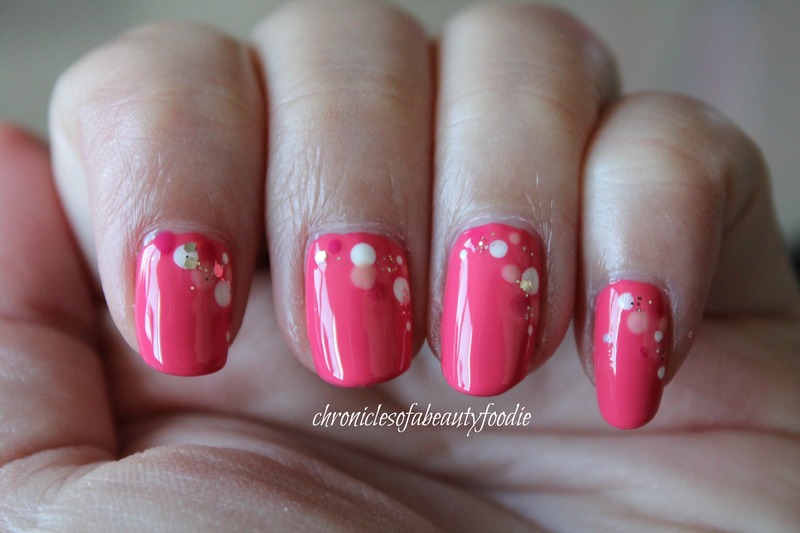 Then taking your peachish pink color apply blobs of paint over the french tip. This doesn’t have to be neat since flowers don’t have a set form. Just try not to apply a really thick layer of paint since it’ll take longer to dry. 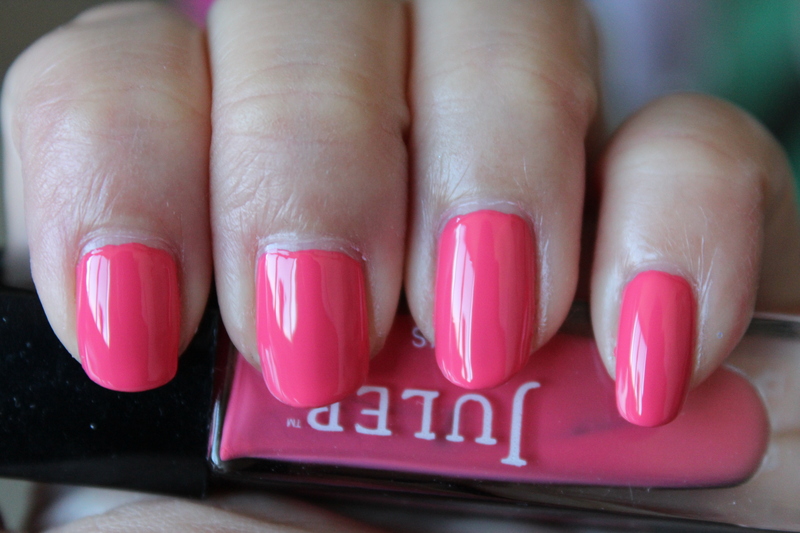 Step 3: Wait until the pink polish has dried. We’re going to use the toothpick next so it’s important that your nails are dry. 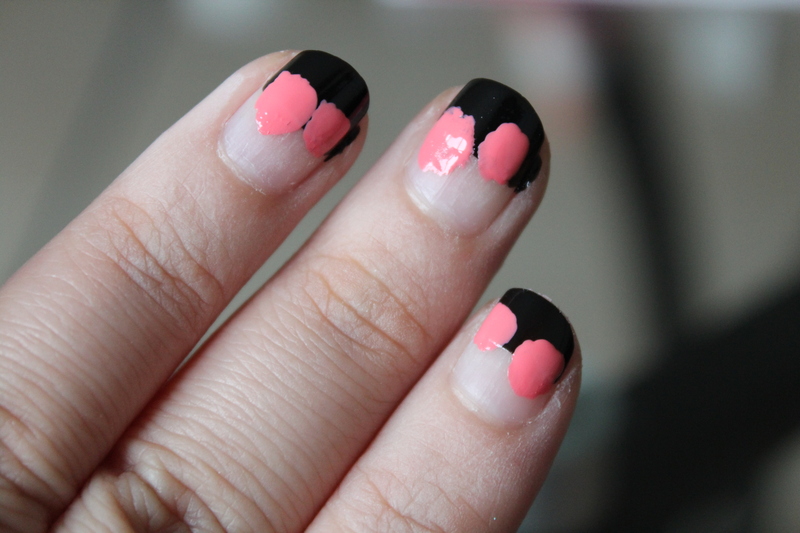 Place some of the darker pink nail polish on your scrap piece of paper. 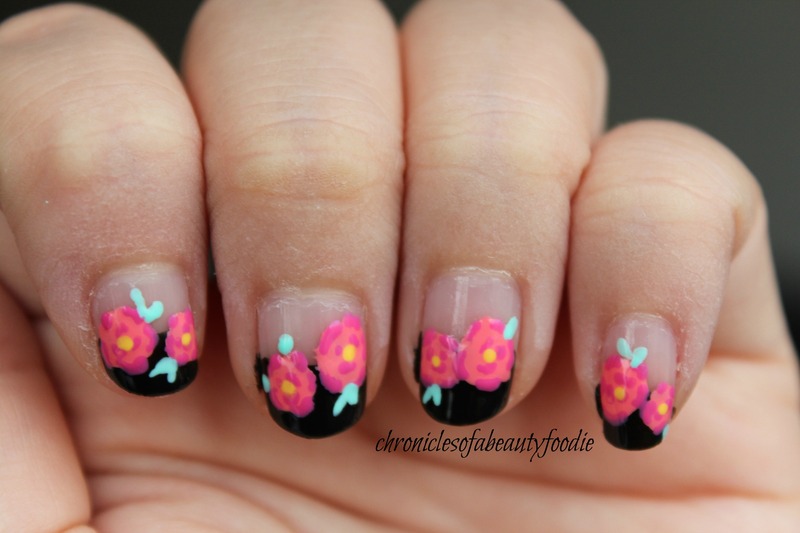 Then dip your toothpick in the polish and draw squiggly lines on the flowers to distinguish the petals. This doesn’t have to be super neat. I generally draw five arcs around the outside for five petals and then a couple additional arcs on the inside to make it look like there are layers. 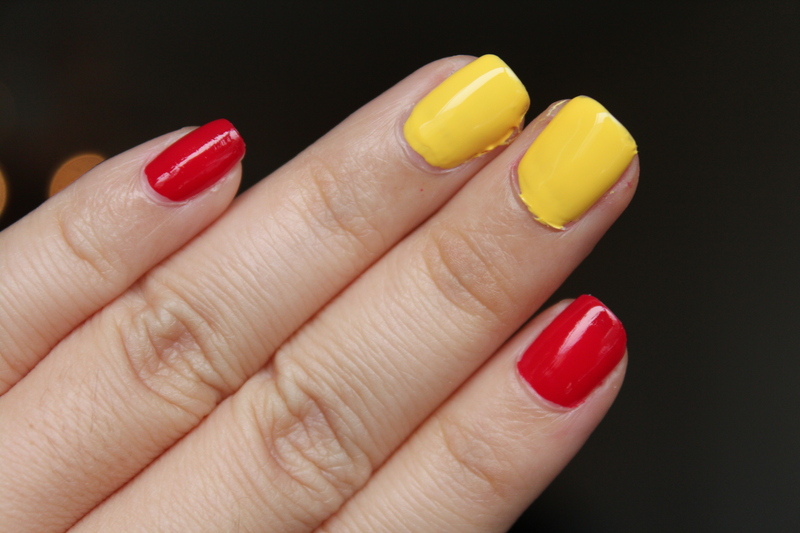 However, make sure you wipe your toothpick tip every so often so that you don’t have a blob of polish at the tip. You want the toothpick to be clean so that you can draw the fine lines. 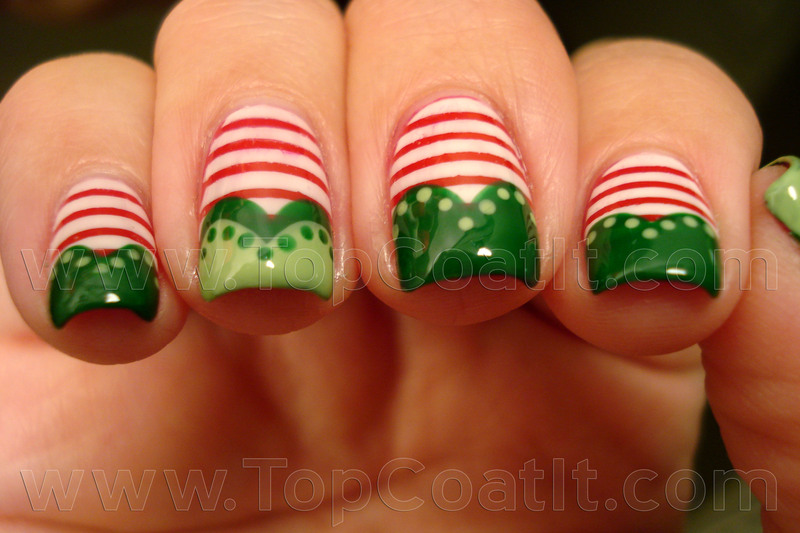 Step 4: Place some of the green nail polish on the scrap paper and using your toothpick draw lines to create leaves. Step 5: Place some of the yellow nail polish on the scrap paper and using your toothpick place a dot in the center of each flower for the pollen. 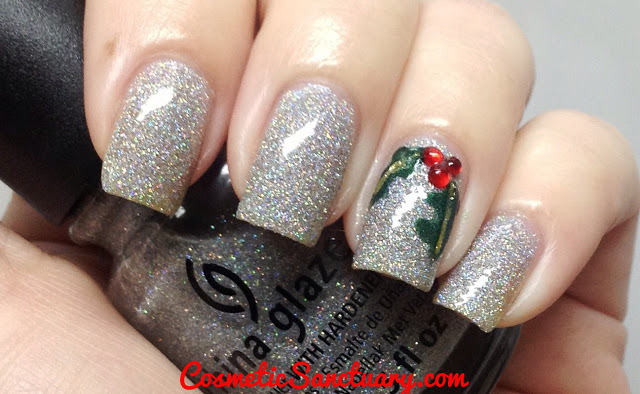 Step 6: Add a top coat to seal in the polish and add some shine to your nails and you’re done. I think spring is one of my favorite seasons, well in theory since Hawai’i doesn’t really have seasons. From a fashion standpoint, I love all the colors and floral prints that come out. From a work stand point, I love the fact that busy season is over. Overall, I just feel like it’s a bright and happy season, if that makes any sense. 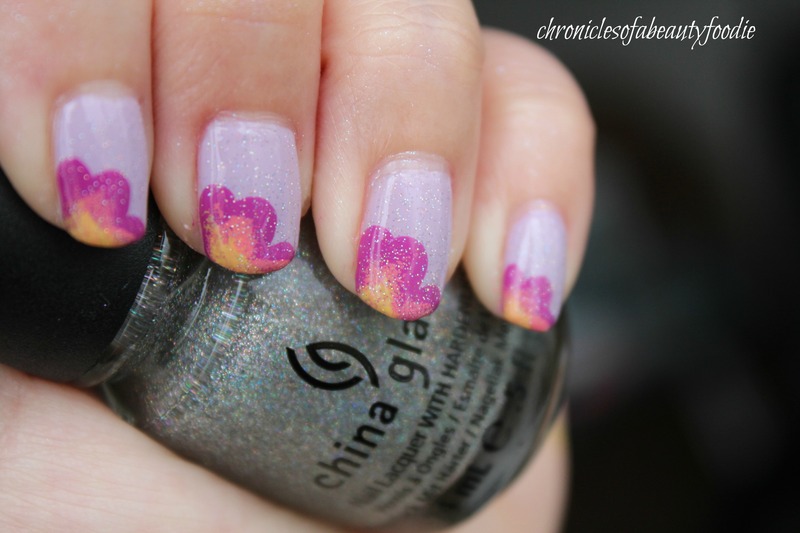 So although I’m a little late, in the spirit of spring I thought I would come out with some floral nail designs. 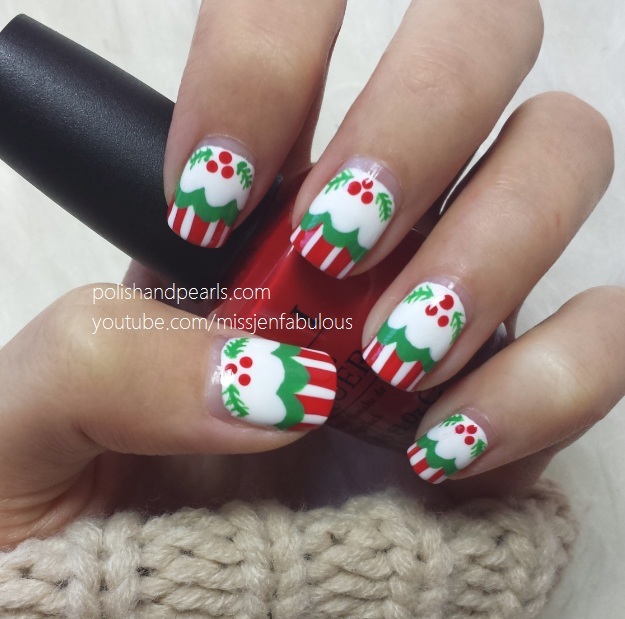 Step 1: Paint your nails with two coats of your background color. 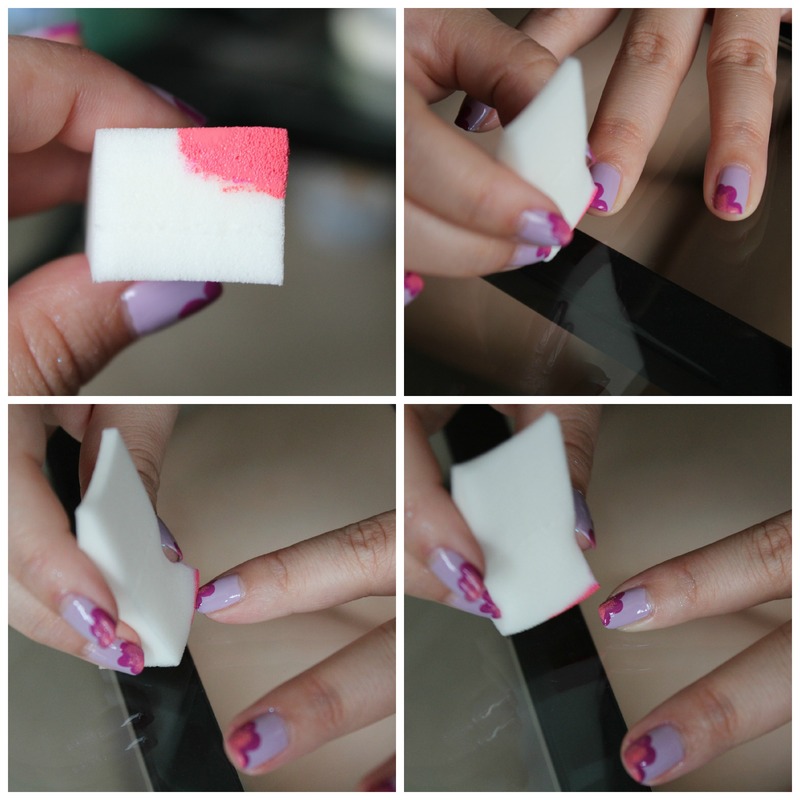 Step 3: Brush your second color onto your make sponge. Dab some of the excess paint off, and then dab it over your first flower color following the three petals you made. Make sure you don’t completely cover the first color. 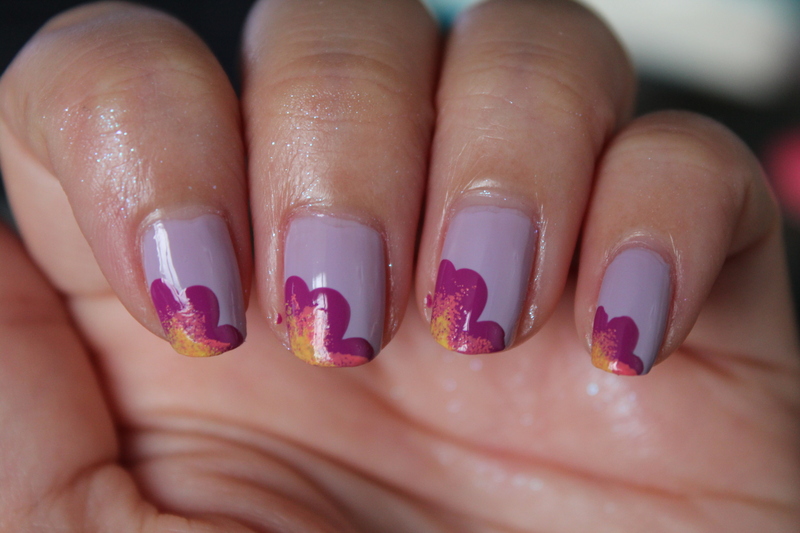 We’re going for a little bit of a fade effect, as if each petal changes from pink to purple. 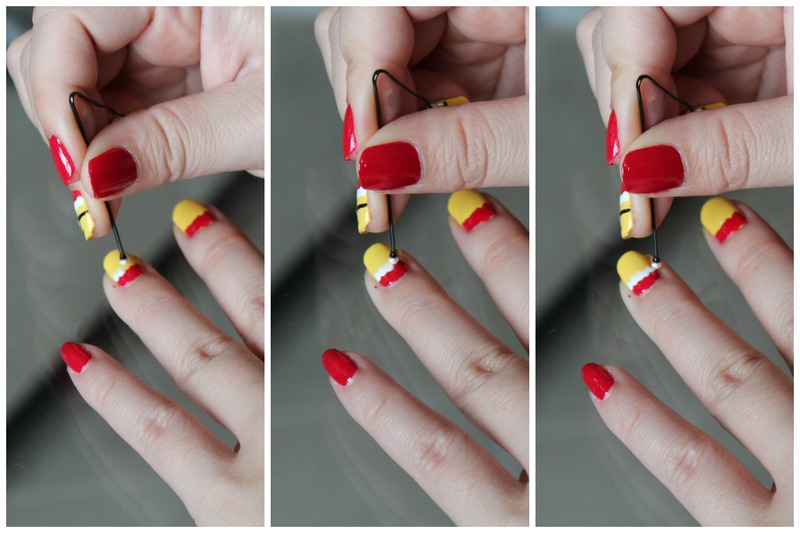 Continue this step for all your nails, and reapply nail polish onto your makeup sponge as needed. Step 4: Similar to step 3, brush your yellow onto a new makeup sponge (or another corner of your first sponge if you still have room). 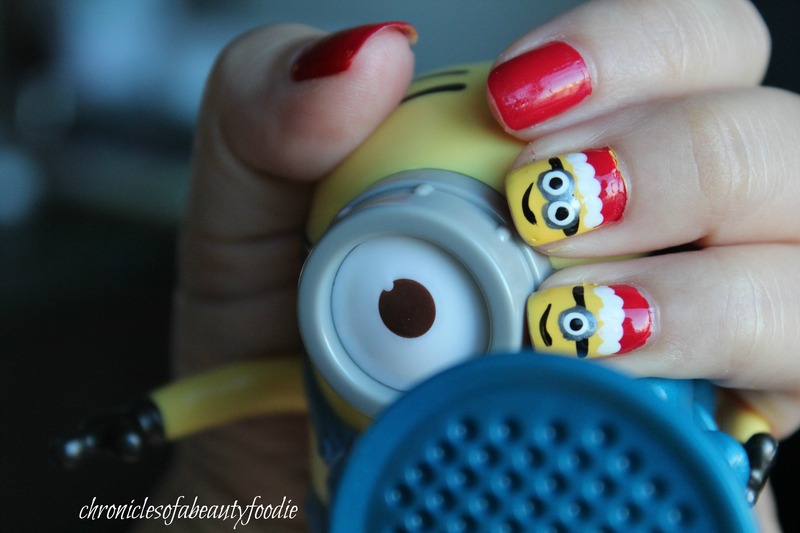 Dab the excess paint off and then dab the yellow into the corner of your nail. 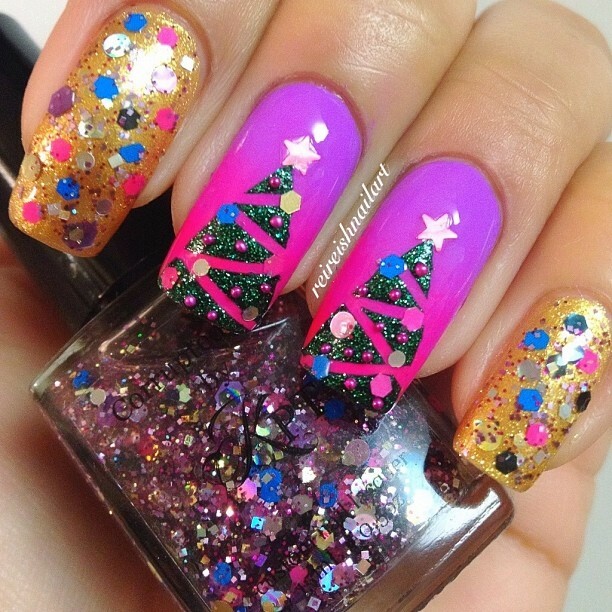 Step 5: This is optional, but if you want to add some extra sparkle, top your nails with a fine glitter polish. 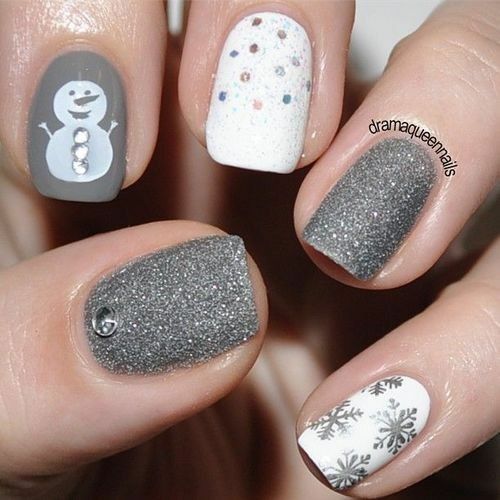 Step 6: Apply a top coat to seal your polish and add some shine to your nails, and you’re done! I’ve been in the mood for pink nails lately. 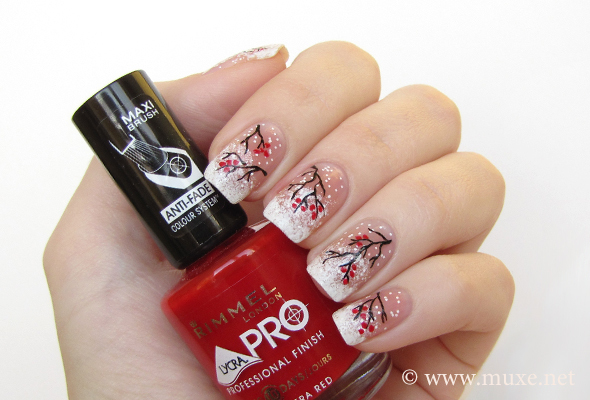 I think it’s the anticipation of spring and bright colors. Plus there’s something about bright colors that just makes me feel a little more happy inside. Since I couldn’t decide which shade to go with, I thought why not just use them all. 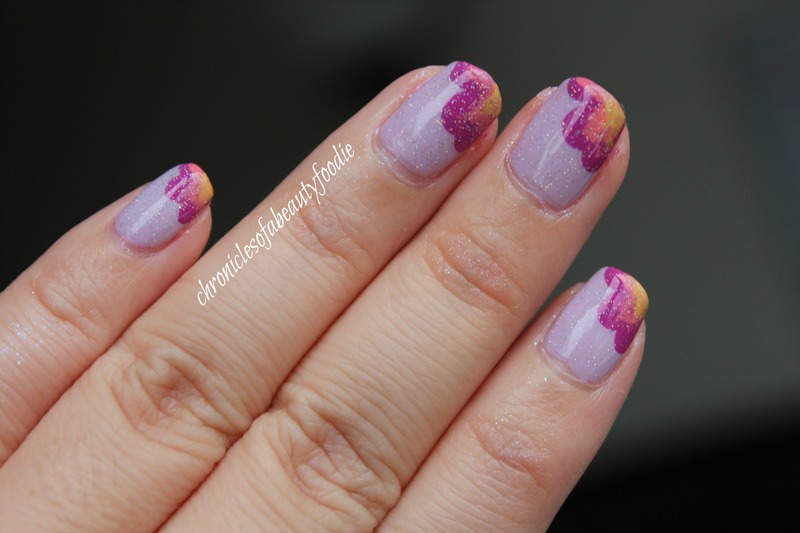 Step 1: Paint on your base polish and let it dry to the touch. Step 2: Using your first dotting color, place a couple drops on your scrap paper (I used an old giftcard) and use your dotting tool to create dots. If you don’t have dotting tools of different sizes, you can create smaller and larger dots by changing the amount of pressure you apply. 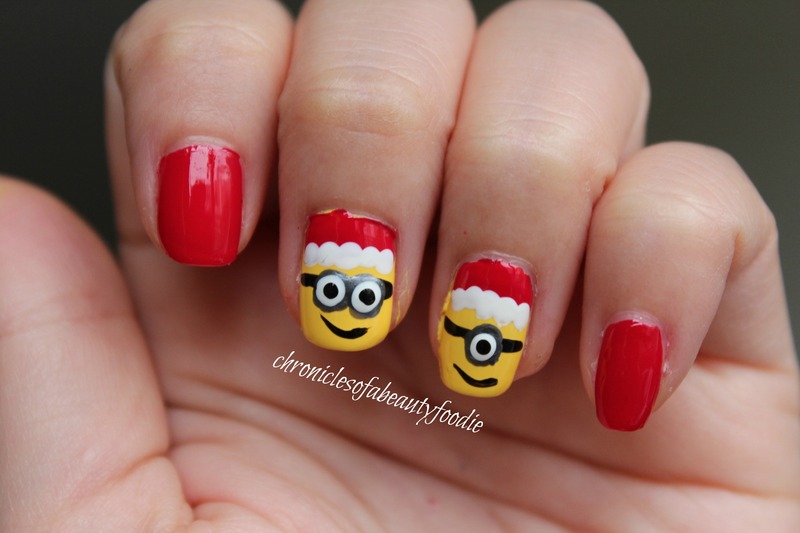 I did mine, generally, in a diagonal across the outside of my nail. Don’t forget, you will be using other other colors, so 3-4 dots will do. *Note: I would use your colors in order of opacity and/or shade, using your least opaque color or lightest color last. Step 3: Repeat step 2 with as many colors as you like. I finished my nails with Sephora’s Only Gold For Me to add some sparkle on top. 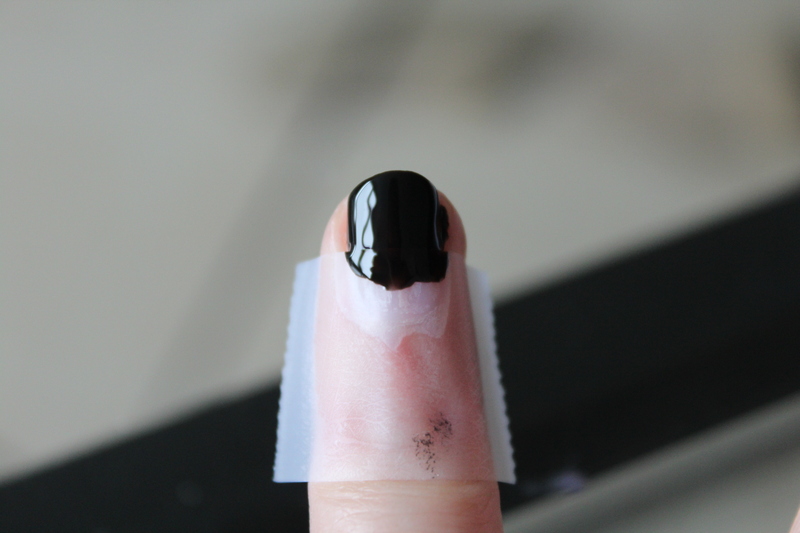 Step 4: Add a top coat to seal in the polish and add shine, and you’re done. Okay I know . . . it’s been awhile. I had a lot of Valentine’s day posts planned, but with work and moving the timing just wasn’t there. 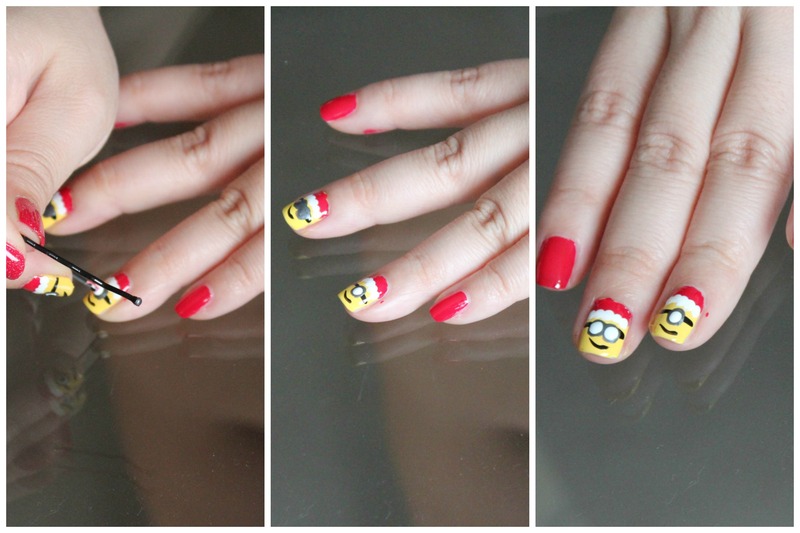 It’s okay, though, there’s still a few days left, and I was able to pump out at least one more nail tutorial. 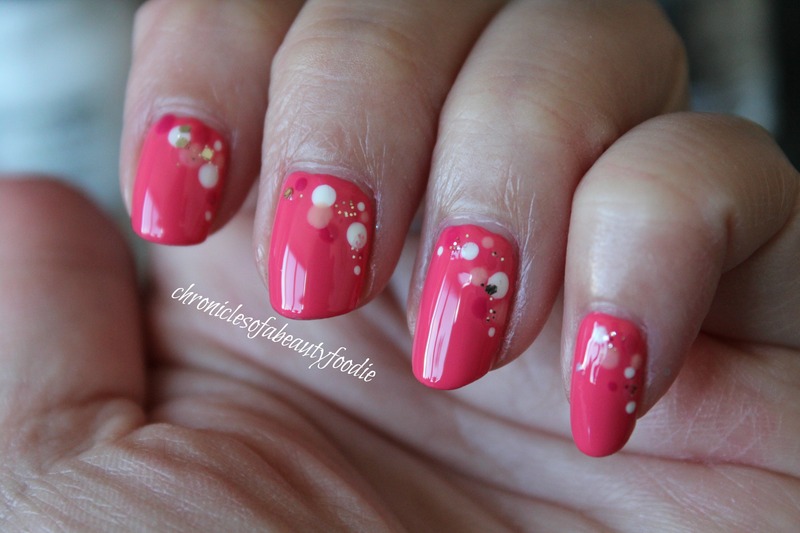 Who doesn’t love french manicures? The look is so clean, simple and elegant. So of course I thought it would be perfect for a Valentine’s day date. 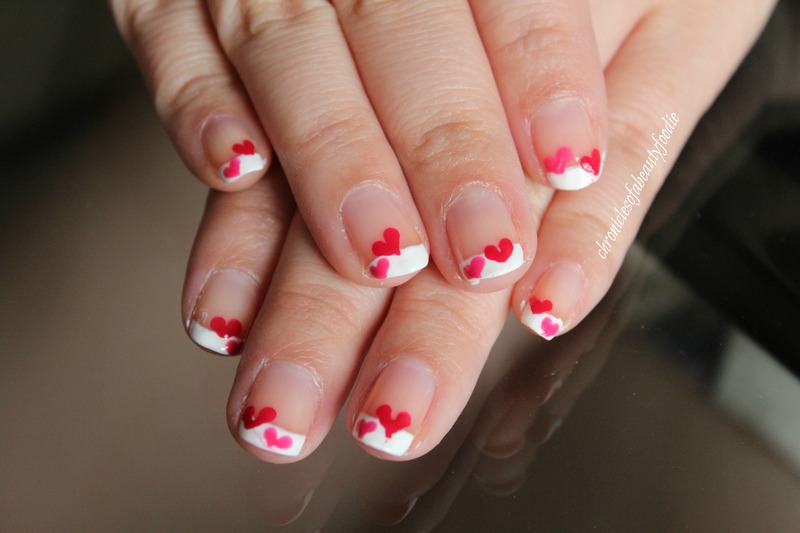 Add a few hearts, nothing too extravagant, but still cute and v-day themed. 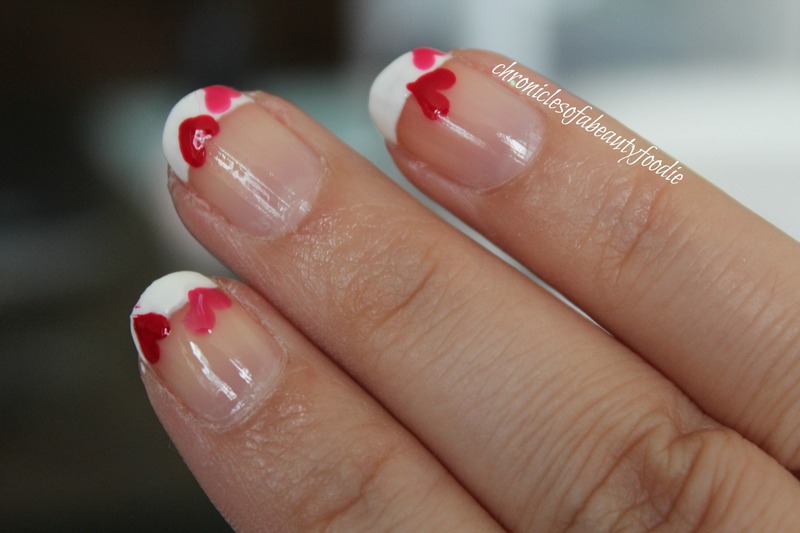 Step 1: Using the white nail polish, french tip your nails. 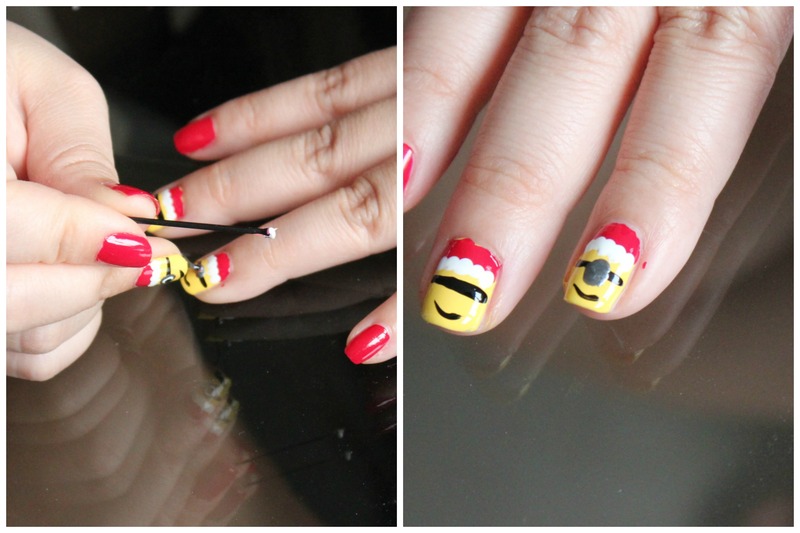 The easiest way to do it is to roll your finger and move the brush as little as possible. If you mess up, don’t worry, take an old eye shadow brush, dip it in nail polish remover, and swipe back and forth (like a windshield wiper). 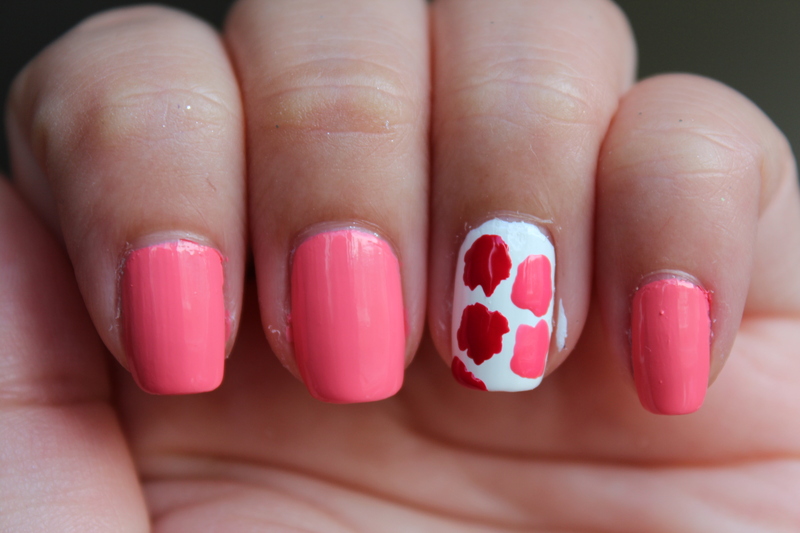 Step 2: Put some red nail polish on your scrap paper and using your dotting tool, create a heart. 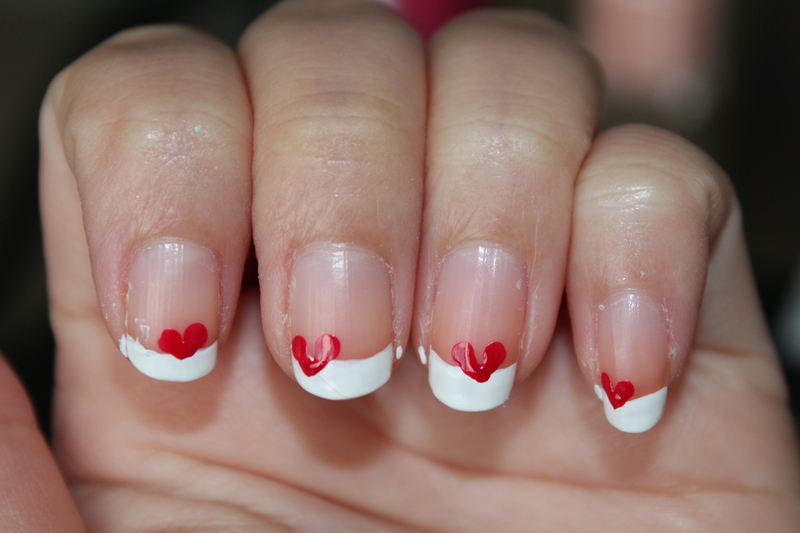 I randomly placed one heart on each nail. 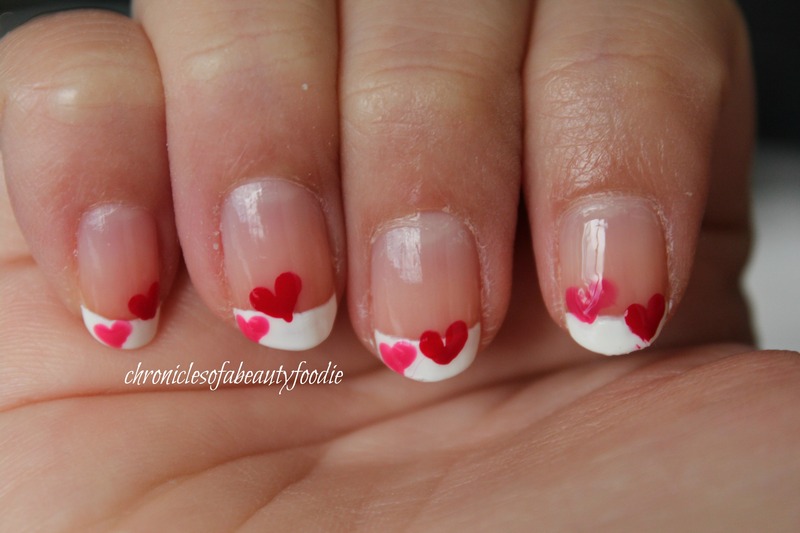 See this tutorial on how to make a heart. Step 4: Paint on your top coat to seal the polish in and add a nice shine. Step 5: If you have some extra paint on your fingers, take a q-tip and dip it in some nail polish remover and clean it up.